Block by block. Child by child. That’s how Geoffrey Canada set out to save at-risk children in some of the most devastated neighborhoods of Central Harlem. In 1970, he founded the Harlem Children’s Zone (HCZ) – a non-profit organization that’s been called one of the most ambitious social experiments of the century. Canada, 56, says his goal is to offer these children all they need to succeed in an ever-changing, competitive world. It’s a lofty dream, but one Canada has devoted his life to – and one he says the public school system has so far been unable to accomplish. Canada himself could have been a victim of this kind of America. He grew up in a poor, violent neighborhood of the South Bronx, living in a tenement home with his single mother and three siblings. His mother worked several jobs to put food on the table. She also impressed upon her kids the importance of education. Canada listened. He was a driven student, and worked his way through Bowdoin College, then the Harvard School of Education. When he came home to the Bronx, he says he was stunned to see that in all the years of his absence, little had changed. “If you happen to grow up like I did, and you went to a school that failed 70 to 80 percent of its kids, and you go back 50 years later, and see the same failure rate, you say to yourself, how could this be?” he says. That’s when his work as a child advocate began. In 1983 he joined a nonprofit in Harlem called the Rheedlen Centers, and in 1998 he became its President. Instead of targeting the Center’s work on a handful of specific issues, Canada decided to cast its net wider to several blocks of Central Harlem, an area in which he promised to offer services to every child. Today, the Harlem Children’s Zone operates on a fiscal budget of approximately $58 million – some of it donated by private sources, some corporations and a small portion from the Federal Government. True to Canada’s goal, the organization serves more than 10,000 at-risk kids – providing them with a network of social services and a high-quality education – all at no cost. 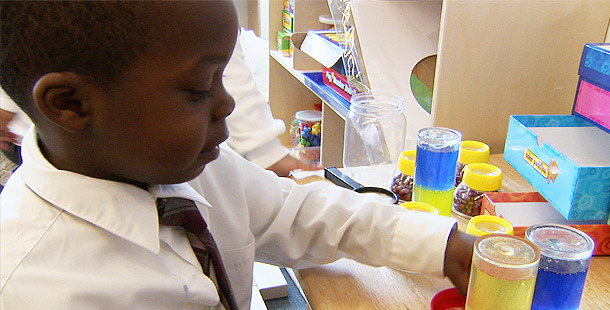 What’s more, Canada says, the Harlem Children’s Zone has diminished the societal costs of failing to provide these kids with sufficient education and healthcare. Canada also believes in intervening early through what’s called the Baby College. The workshop invites new parents to learn how to raise their kids to ensure a good education. To minimize the chances that his kids will fall victim to street crime, he keeps them off the streets – requiring after-school activities and longer school years. So far, it seems, the formula is working – with approximately 95 percent of the kids who attend going on to college. And other cities, including Baltimore, are taking note – deliberating copycat programs in their own at-risk neighborhoods. What will it take for more of America’s schools to produce these kids of results? According to Canada, success depends on accountability.